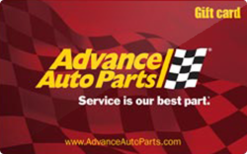 Advance Auto Parts sells quality auto parts, advice and auto accessories. Buy a discounted gift card to use in-stores. Giftcards can be used like cash and can be used on motor oil, filters, etc. Keep in mind the AAP gift cards can only be used in-stores and not online.